This stylishly bohemian and sophisticated small boutique hotel is tucked away behind iron-bossed mudéjar doors in Seville\\\'s Barrio de La Alfalfa. 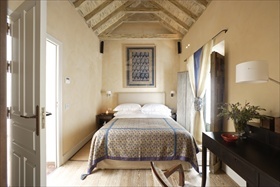 Lovingly converted from a XVII century casa palacio, it has six cool, spacious rooms with hi-tech mod cons, supremely comfortable beds and large marble bathrooms with walk-in rain showers. Contemporary Spanish cuisine is on the menu. Ideal for private functions, house-parties and high-profile guests looking for a discreet town address a stone\\\'s throw from the Giralda. Romantic and cultural getaways for singles, couples and small groups. Exclusive use of the whole property for groups of up to 8 guests. In-house catering for up to 44 seated guests for birthdays, weddings and anniversaries. Well-organised excursions. Excellent night life, restaurants, tapas bars and flamenco shows in walking distance. Friendly and understated service in an intimate and relaxed atmosphere. Staff speak Spanish and English. 24 hr reception, lift. Art gallery. DVD library. In-room safety deposit box, complimentary access high-speed wireless internet throughout hotel (high-speed W-LAN connections in the rooms). Rooms have comfort cooling/heating system and windows that open. Minibar in all rooms. Laundry, dry-cleaning and pressing service; dressing gowns offered for the use of guests during their stay. Evening turndown service. Hairdryers in all rooms. Beauty treatments and massages by appointment. Babysitters on request. Tailor-made excursions in Seville and province with private guides. Private chauffeur service for airport/train station transfers and excursions. Valet parking service provided. EXCLUSIVE USE of Corral del Rey for parties, exhibitions and private functions can include: 2 superior rooms, 2 deluxe rooms and 2 junior suites (in-house guest capacity 12); roof terrace with mirador and plunge pool; flamenco entertainment; 3-course dinner for up to 30 guests with in-house catering and selection of menus; photographers, DJs and private transfers; tailor-made excursion programme. 6 INDIVIDUALLY-DESIGNED BEDROOMS: 2 Superior (180 sq ft with queen size beds), 2 Deluxe (220 sq ft with queen size beds) and 2 Junior Suites (320 sq ft with king size beds), are situated around the galleries of the central courtyard. They feature an eclectic mix of ancient and modern and an in-room state of the art sound and vision system with flat-screen plasma satellite TV, DVD player, iPOD docking stations, complimentary wireless internet access, high-speed LAN connection, direct-dial telephone and in-room safety deposit boxes. Minibar. Large ensuite bathrooms with walk-in rain showers (and tubs in the junior suites); hairdryers. Bespoke bed linen and pillows, bathrobes for guests´ use during stay. The building and 1 Superior room adapted for disabled guests. Year-round room rates, including continental breakfast. baby´s cot free; both available on request at time of booking. Non-smoking rooms available. No communicating rooms. Check-in: 14:00 hrs. Check-out: 12:00 midday. Times are flexible depending on availability. Continental breakfast included in the room rate. American Express, Visa, Master Card, Euro Cheque, travellers' cheques, cash. The Corral del Rey does not accept or exchange foreign currency. In the event of a no-show or cancellation within 7 days of the date of arrival, the amount equivalent to 100% of the total booking value will be charged. Bar/café: All-day relaxed tapas menu with good selection of Spanish wines. Capacity 55 seated, 100 standing. Open Mon-Sun 12:00-24:00. Private dining and canapé menu on request. Room service available. Functional, well-designed meeting room space 8.23 x 3.66 metres, lower ground floor. Integrated audio visual and sound system. High-speed wireless internet access/LAN connection. Comfort cooling/heating. Suitable for exhibitions and private functions. Breakfast, lunch and dinner meetings catered for, max 20 downstairs and 24 upstairs; tailormade menus. Rooftop plunge pool with terrace and fabulous views of the Cathedral and La Giralda. Massages in your room or the roof garden, on request. Cost of 1 hour massage: 90 euros + VAT. Smoking is permitted in the hotel. Non-smoking rooms are available. Daytime: leisure wear. Evening: casual wear. Corral del Rey is in the Barrio de La Alfalfa, five minutes walk from the Cathedral in the heart of Seville. It is located in a narrow historic street and within walking distance of the main historic centre. As Corral del Rey is located in the heart of the old quarter, access by car is difficult, and guests are recommended to use the hotel's private transfer service. If you do arrive by car, recommended parking is at the nearest secure public underground car park, Cano y Cueto, located on Avenida de Menéndez Pelayo which is approximately 15mins walking distance from the hotel. The hotel provides a valet parking service. Private chauffeur-driven car service available for airport/train station transfers/excursions. SEVILLE airport: 10.7 km/20 min. JEREZ airport: 93.9 km/67 min. on the AP-4. GIBRALTAR airport: 195 km/2 hrs. 16 min. MALAGA airport: 214 km/2 hrs. 29 min. on the A-92. FARO airport (Portugal): 202 km/2 hrs. If you are flying from Gibraltar, allow 1 hr more to compensate for possible traffic holdups. SEVILLA: Estación SEVILLA: Estación de Santa Justa, 3.8 km/8 min. Superbly organised excursions are part of the Corral del Rey experience. Tailor-made programme arranged on arrival, with maps, directions, parking, recommended restaurants, shops and half- or full-day private guides. Excursions to cities and towns: Seville, Jerez, Cadiz, Cordoba, Sanlucar de Barrameda, Vejer de la Frontera, Medina Sidonia. Theme excursions: the white villages, Costa de la Luz beaches, national parks and lakes. Visits: to an exclusive bull-breeding ranch, a family-owned sherry bodega, an authentic flamenco show, Yeguada de La Cartuja stud farm, the horse show at La Real Escuela Andaluza del Arte Ecuestre, birdwatching in Coto Doñana. Corral del Rey provides a list of recommended restaurants.